After finishing Michelle Paver's mountaineering book, Thin Air, last week, I found myself caught between two competing rules I'd set for myself this year: Read What I Feel Like Reading, and No New Books. I knew I had Mountains of the Mind hidden in the cupboard for when the No New Books rule expires, but the timing seemed too perfect to miss. So Read What I Feel Like won. The penultimate chapter of the book, Everest, was utterly gripping. 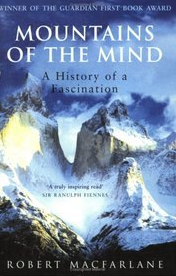 It describes the story of George Mallory, a man who became obsessed with Mt Everest. He tried three times to climb the world's highest peak, in 1921, 1922 and 1924, and vanished without trace on the last attempt. For years mountaineers have speculated on whether or not he had reached the summit before his death. Mallory's body was discovered, almost perfectly preserved, in 1999, seventy five years after he vanished into the mountain's mists: a tragedy, a myth, a mystery. Now I'm on fire to learn more about this charismatic, driven young man, who adored his wife and young children and yet couldn't resist the hunger to climb. It looks as if the No New Books rule may be broken again. 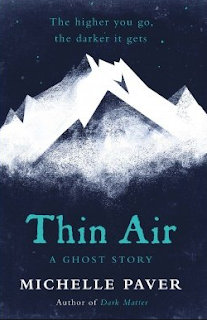 Borrowed from a friend at book group, Michelle Paver's Thin Air is a ghost story set on a 1935 expedition to climb Kangchenjunga in the Himalayas. For many years thought to be the world's highest mountain, it was relegated to third place only in the 1850s. I was familiar with Kangchenjunga from references in the Swallows and Amazons books, where the hills of the Lake District that the children climb and camp among are promoted to Himalayan status. Apparently Paver has written a couple of other ghostly stories, Dark Matter and Without Charity, so I might just hunt those out too. This was enjoyably scary, but not so terrifying that I couldn't bear it! And just as I was writing this post, a fellow who gives ghost tours of Melbourne happened to come on the radio... Spooky! First published in 1957, The Warden's Niece is a very gentle book, but the mortifying Francis Copplestone is a wonderful character, and the three Smith boys, lofty Thomas, nervous Joshua and the insufferable James, are so vividly drawn that I have never forgotten them. (I may have had a slight crush on Thomas.) I was so pleased to discover that there are more books about the Smith family -- Maria's story ends just as you would hope it might, with her mystery solved and an affectionate relationship beginning to develop with her uncle. I think this might be where my adolescent love of Oxford, later nourished by Brideshead Revisited, truly began. Paul Gallico's Jennie falls into the CATegory (see what I did there?) of books that I probably wouldn't have picked up if I didn't have to read it for book group. As a rule, I'm not a massive fan of animal books, as I may have mentioned a couple of hundred times before, so a book with a cat on the cover, however cute and wistful, wouldn't push my buttons. Gallico excels at describing the habits and disposition of cats -- apparently he owned 28 cats! -- and Jennie and Peter's adventures are mostly plausible and absorbing, but I couldn't help feeling some misgivings about their relationship. Jennie begins as a maternal figure, protecting and teaching the naive Peter. In the enjoyable middle section, they become true partners in adventure: taking a ship to Scotland, confronting fierce dogs and rats, getting trapped high on the girder of a bridge. But towards the end of the book, their friendship takes a peculiar turn. Peter is enticed away by a 'charming' cat called Lulu (who I found merely slappable) and loses Jennie for a time; when they are reunited, their roles reverse and Peter becomes Jennie's protector and champion. We're told he's grown and matured into a strong, handsome tomcat, capable of fighting off Jennie's undesirable suitors, and the implication is that Peter is almost acting as Jennie's mate would do. But inside, he is still an eight year old boy, and the overall effect is slightly creepy. 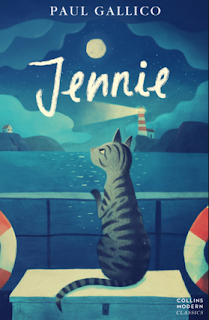 Jennie has been reissued as a Collins Modern Classic. I hope it finds the audience it deserves. Is there any thrill to compare with the excitement of discovering a hitherto unknown book by one of your favourite authors? Especially when you find it at Savers and it only costs $3! Gillian Avery only died last year. 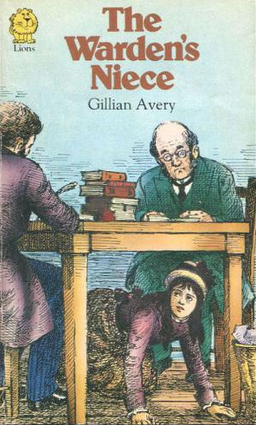 She was the author of one of my absolute favourite childhood books, one I returned to over and over, The Warden's Niece, her debut novel which was commended for the Carnegie Medal in 1957. Set in Victorian Oxford, The Warden's Niece centres on Maria, who runs away from her horrible school and tries to impress her academic uncle into letting her live with him permanently by conducting a piece of independent historical research. Maria's ultimate ambition is to be a Professor of Greek at Oxford -- a lofty aim, considering they were barely allowing women to study at Oxford in 1875. On the face of it, this sounds like a dull premise for a novel, but Maria becomes entangled with the lively trio of boys next door and their fantastically unconventional tutor, Mr Copplestone (otherwise known as 'the spider-monkey'), and their embarrassing adventures make for an energetic narrative. 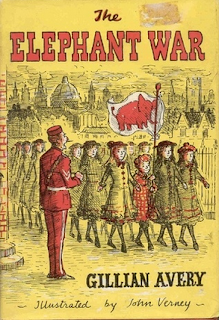 Oh dear, this is supposed to be about The Elephant War, which was written after The Warden's Niece but is actually set shortly before the events of that book. 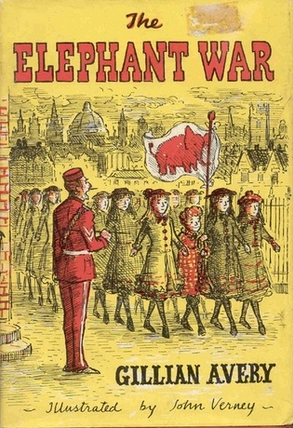 This time our heroine is Harriet, who also becomes entangled with the three Smith boys, but not in a friendly way -- this time it's a war, nominally over whether to save Jumbo the elephant from being exported to America. But soon events spiral out of control, with parcels and insults hurled in the street, pursuit around the greenhouses of the Botanical Gardens, and tadpoles poured through letterboxes. I didn't love this as much as the first book, because it lacks Maria's love of history and earnest academic dreams, but it was still fun. And I learned that there are three other books featuring the irrespressible Smiths -- something to hunt for in my perpetual secondhand quest, though I'm not hopeful of finding them. Evie has been obsessed with the Warriors series for years now, but this is the first time I've actually sat down and read one from beginning to end, despite having about ninety of the bloody things clogging up the Kindle. And I have to say I was pretty impressed! The premise is that there are groups of wild cats, each hunting in their own territory and largely hidden from the Twolegs. Thunder Clan lives in the forest, River Clan by the river, Wind Clan on the moor, and so on. 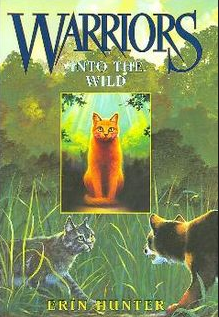 In this introductory novel, Into the Wild, Rusty the pet kitten (a despised "kittypet") runs away to join Thunder Clan, becoming Firepaw the apprentice, and having proved his worth through various trials and battles, graduates to become Fireheart the warrior. The world building in this series is tremendous -- I can well understand why kids become absorbed in this universe. The clans are organised into warriors who hunt and defend territory, queens who rear the kittens, youthful apprentices, kits and elders. Each clan also has a medicine cat who learns the secrets of herbs and healing. The cats have a well developed history and mythology, even a form of spirituality: dead cats pass into Star Clan, and can communicate with the living leaders. (Evie tells me she doesn't believe in heaven, but she does believe in Star Clan.) And the stories span whole generations and cross from clan to clan. There is a whole parallel world of fan fiction, art and animation revolving around Warriors, and I can see why. These cats inhabit a world between children and adults, living secretly in the woods but facing real perils and difficult adventures. Birth and death, injury and betrayal, friendship and fear are all part of their lives. I've never been a huge fan of animal stories, but this series has a depth and solidity that makes it work. I took this cover image from Fishpond, so I suspect it's the actual copy I bought! Bornadog, from WOOF, tracked it down for me after I said I'd been hunting for it for a while. The Whitten Oval Online Forum is a wonderful community. When the Bulldogs made it into the Grand Final last year, 60 years after their last appearance, WOOF's motto was 'no Bulldog left behind.' Somehow, everyone looking for a ticket was helped to find one, thanks also to the generosity of other football fans who had tickets but gave them up so that the maximum number of Bulldog fans could experience the day. Anyway, the 1993 season, though it began with high hopes, did not have the happy ending of 2016. Nonetheless, it's a wonderful read, even though I was unfamiliar with many of the characters and the world of AFL has changed enormously in the last twenty five years. One of the players in the 1993 side was a young Luke Beveridge, who coached last year's team to the ultimate victory. It struck me that Beveridge's coaching style might have been influenced by his coach at the Bulldogs at this time, Terry Wheeler. Wheeler was a coach ahead of his time. In an era when most coaches were stern, shouty disciplinarians, Wheeler aimed to create an environment where each player could produce his best. He would quote Jonathan Livingston Seagull, took his team sky-diving, played bag-pipes before a match. The club president has said that if he'd had his time over, he wouldn't have sacked Terry Wheeler. But Wheeler is still a close friend of the club, and rejoiced in last year's victory with the rest of us. Martin Flanagan writes about football like no one else. He understands the romance, the anguish, the bonds that knit a club together. And he has a poetic eye. He describes one player on the field as looking like "a bread van surrounded by sports cars." Another player's shoulder muscles "bulged like plates in a suit of armour." In my opinion, he is as fine a writer as his brother Richard, whose novel Wanting I read at the same time as Southern Sky, Western Oval. But because he writes about sport, he is under-rated by literary critics. 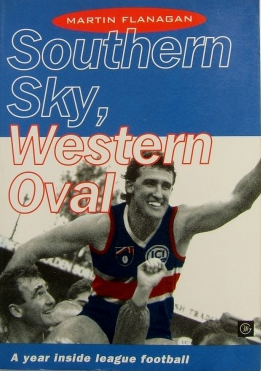 Martin Flanagan has been asked to write a book about the 2016 Western Bulldogs premiership. I can't wait. 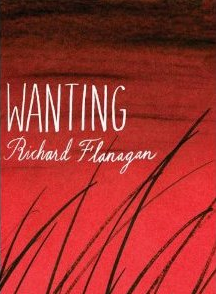 But as literary novels go, Richard Flanagan's Wanting was a good place to start -- it's pretty short, and its premise sounded promising. It loosely interweaves three true-life stories: that of Charles Dickens, who is facing a crossroads in his life and marriage when he meets the young actress Ellen Ternan; Lady Jane Franklin, who we see in two stages of her life, the wife of the Governor of Van Dieman's land (now Tasmania), and as the grieving widow of the same husband, lost on a polar expedition; and lastly (and to me, most interestingly) the story of the young Aboriginal girl Mathinna, who was adopted by the Franklins during their time in Tasmania, and then abandoned by them. Flanagan said that this novel is about love and yearning, not really about history, and I gather he has made his own use of the facts to suit his narrative. The writing is beautiful and the links between the three main characters are certainly intriguing. But in the end I found that the tragedy of Mathinna held my attention much more firmly than Lady Jane's lamentations or Dickens' mid-life crisis. Richard Flanagan's subsequent novel, The Narrow Road to the Deep North has won multiple awards and accolades, but I've decided that it will be too harrowing for me to handle at the moment. Is it wrong that I am consciously looking for diversion and enjoyment in my reading? I hope this is only a temporary state of affairs. I will come back to 'serious' reading, I promise! Alas, I fear with this fourth volume in the series, Jackson Brodie might have run out of puff. Perhaps Kate Atkinson agreed, because Started Early, Took My Dog (the title comes from an Emily Dickinson poem; there is a surprising amount of poetry in what is ostensibly a crime novel) is the final Brodie book and she has moved on to different projects. There is still a lot to enjoy here, particularly in the story of Tracy, ex-copper turned security guard, who impulsively buys a stray child at the start of the novel and spends the rest of the story on the run with her. This is a tale of lost children -- stolen, adopted, bereft and betrayed in various ways. Sadly, though we spend a lot of time with Jackson Brodie, who is a character I like a lot, he doesn't actually DO anything much in this book -- he's supposed to be investigating the biological origins of his client, Hope, but most of the time he just wanders around ruminating while the reader has already put two and two together before he does. And the vile, blokey police culture of the 70s is on full view here -- not as much fun as Life on Mars, which she references. 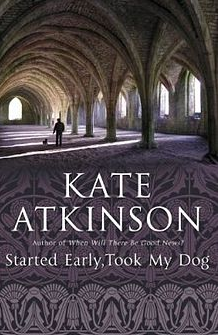 Reading a Kate Atkinson novel will never be a waste of time, but I must admit I was slightly disappointed in this one. Farewell, Jackson! It was fun while it lasted.